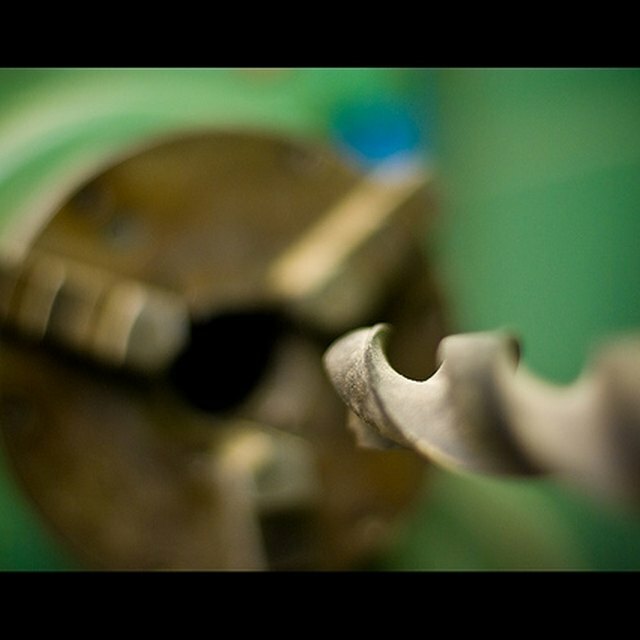 Drilling machines use drill bits to cut holes through materials such as wood and metal. These drill bits come in a wide range of sizes, making it easier to customize the size hole for your project. Fractional inch sizing is common in the U.S. for measuring drill bits, using fractions of an inch. U.S. number sizing is an alternative sizing system which requires using a number chart to determine the relative size. To compare drill bits from one sizing method to another, use a universal sizing chart. Check the sides and bottom of the drill bit for a fractional designation. If you do not see the size listed, check with your drill bit box or case. Usually the sizes will be listed next to the holding place for each bit. If you can't confirm a measurement, measure the bit yourself. Use a drill bit gauge to confirm the fractional size if you cannot find the listed size. Drill bit gauges are flat sheets that have holes for each size bit within a specified range. Put your bit into each hole on the gauge until you find the hole that matches the diameter of your drill bit. Divide the drill bit fraction to get the decimal form. For instance, if you have a drill bit that is 5/32 inch, divide 5 by 32. This would result in the decimal form of .15625. Check the drill bit sizing chart to find the decimal form of your drill bit size. Use this to determine the closest number sizing. Number sizing includes letters and numbers with the largest size, "Z," equal to 0.413 inch. An "A" size is equal to 0.234 inch. This continues from "1" to around "80," though there are larger numbers for very small and uncommonly used sizes. The number and fractional sizing systems don't measure up exactly, so you will have to choose a bit that is as close as possible for your needs. For instance, a 5/32 inch sizing which equals .15625 in decimal form and is closest to number size "22," which is equal to 0.1570 inch. The drill number system does not have a set formula but is based on practical use. Therefore, there is no consistent or measurable way to calculate a fractional size to a number designation without using a comparison chart. Drill sizes on the fractional system go up in every 1/64 inch. This number is always represented as a fraction that cannot be reduced any further. For instance, the drill size 10/64 inch is written in the reduced form of 5/32 inch.